The Whitefish City Council approved the community’s first Climate Action Plan in April 2018 following approval by the Whitefish School District in March. The plan was developed by a citizen’s committee in partnership with Climate Smart Glacier Country. It applies primarily to city and school district operations with additional recommendations for community-level action. Download/view here: CAP Plan- Final, low rez, 4.20.2018. 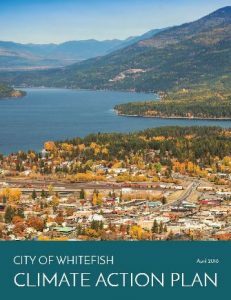 Additional information, including appendices, are available on the City of Whitefish website. 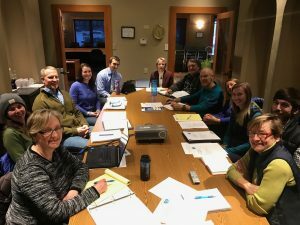 The Whitefish City Council established the Climate Action Planning Committee in December 2016, and a committee of 10 citizens was appointed by Mayor John Muhlfeld in January 2017. Work with City Staff and the Climate Smart Glacier Country partnership to evaluate the City’s energy use and propose specific projects, benchmarks and other recommendations to conserve energy in the City. The Committee may also propose actions to enhance community resilience and prepare for the effects of climate change. Understand and Prepare: The plan identifies the key trends and scientific projections for what a warming, more volatile climate means for Whitefish. It presents a pathway for solutions, such as becoming a fire-adapted community and protecting our water. It presents strategies to safeguard public health, property, and economic vitality. Reduce Emissions: The City of Whitefish, alongside nearly 400 U.S. cities and 195 nations, has committed to keep global average temperatures from rising more than 3.6 degrees Fahrenheit. This plan emphasizes local climate solutions including energy efficiency, local production of clean energy, and conservation of carbon-rich forests and soil. The Climate Action Plan also includes a school district chapter that integrates sustainability into curriculum, facilities management, and community partnerships. The City Council intends to establish a standing sustainability committee to help implement the plan. Climate Smart Glacier Country salutes the amazing team of volunteers who devoted many hundreds of hours to produce this comprehensive report.